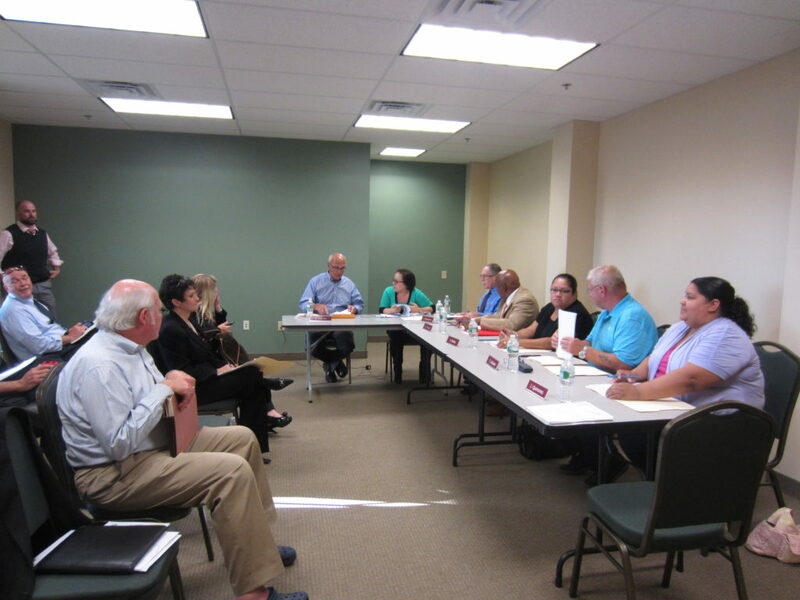 Happy with the new offices, Springfield Housing Authority’s Board of Commissioners held its first meeting at 60 Congress St. in October. 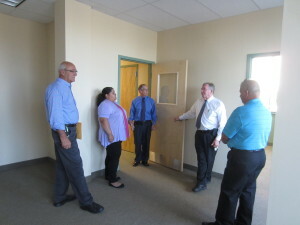 The five-member board toured the top two stories of the office building purchased earlier in the year, and then settled down to the business of the public meeting before an audience of 15, many of them SHA staff. BOC Chairman Raymond Warren, Vice Chairman Willie Thomas and SHA Executive Director William H. Abrashkin praised those involved with the ongoing move to the newly named Central Administrative Offices, including Real Estate Development Project Administrator Sean F. Cahillane, who guided the purchase and build-out of office space. “Three years ago, our central project was to find a building at a good price, get a reasonable build-out done and move in,” Abrashkin noted. “As you can see, it’s all been accomplished in a splendid way. This building will meet all of our operational needs for a long time. “And it’s just right for us – not too fancy, and just what we need,” he added. Left to right, SHA Executive Director William H. Abrashkin stands outside 60 Congress St. with BOC members Thomas Labonte, Angela Robles, Jessica Quinonez and Real Estate Developoment Project Administrator Sean F. Cahillane. Warren said the facility is a perfect match for SHA needs. 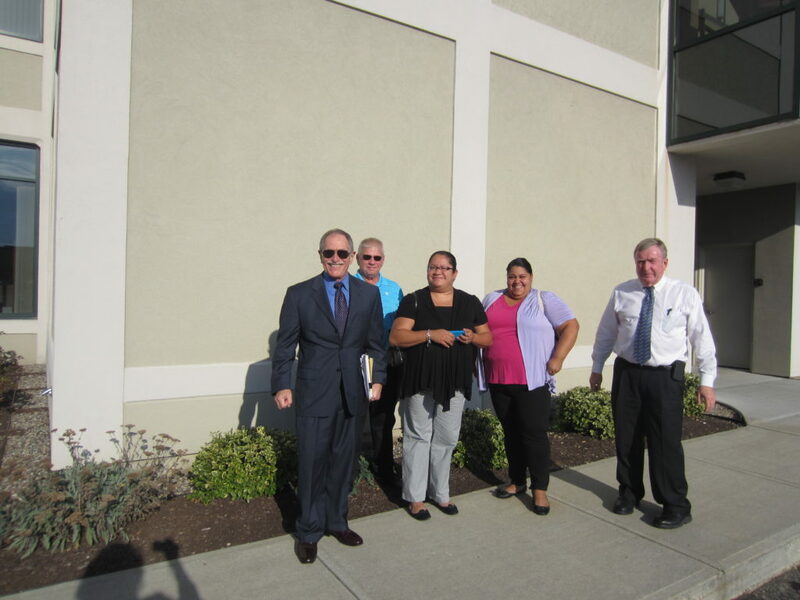 “I have worked with many private companies that were planning facility expansions. They all stated that technology and communication were key to their plans. They all required areas where people could comfortably and conveniently get together on a moments notice to discuss operational issues,” Warren said. “The same goes for the SHA. The SHA is a complex organization that performs many professional services requiring security and confidentiality. The building at 60 Congress St. is a superior business environment that is accessible to employees, customers and visitors. It is also an investment in Springfield and a valuable asset for the SHA. I’m positive that the new offices will be a boost to morale, efficiency and productivity,” he said. SHA bought the building earlier this year in a transaction that included tenants Pioneer Valley Planning Commission remaining on the first two floors. On the top two floors are offices for the SHA Executive, Finance, Information Technology, Public Safety, Purchasing, Communication and parts of Section 8 and Resident Services. SHA Board of Commissioners holds its first meeting in the new Central Administrative Offices at 60 Congress St. The SHA space has been tastefully put together with light tans and shades of greens, and room for meetings and video conferencing. SHA Human Resources Manager Kathy Hardy and IT Director Stephen Ethier are working on the final touches before staff moves in towards the end of the year. While the offices are built out and ready to go, communication technology and furniture must be installed before the move can begin. 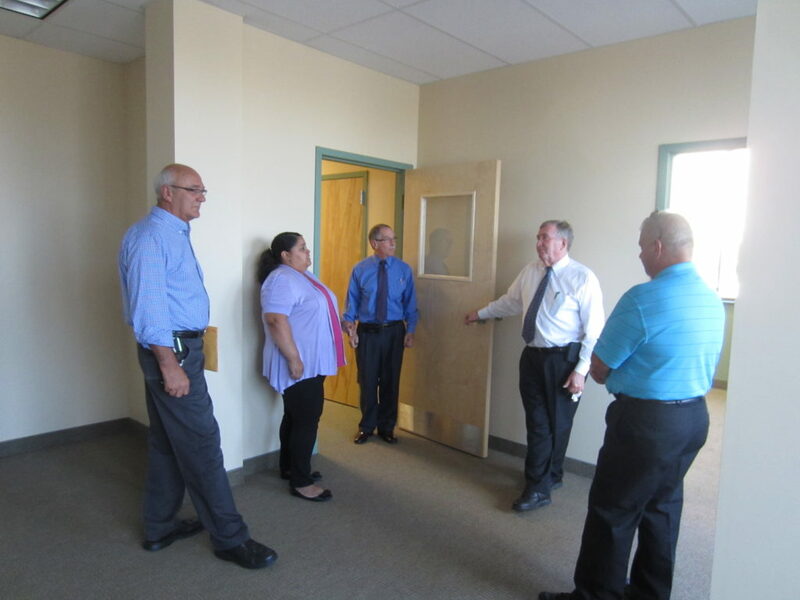 Left to right, BOC Chairman Raymond Warren, BOC member Jessica Quinonez, Executive Director William H. Abrashkin, Real Estate Development Project Administrator Sean F. Cahillane and BOC member Thomas Labonte tour the interior at 60 Congress St.